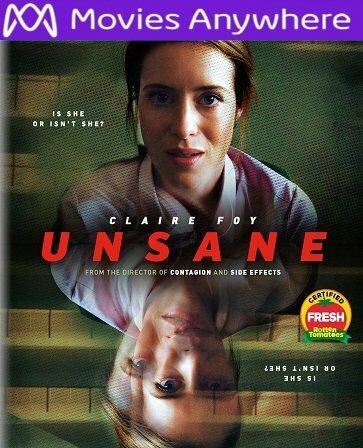 Digital UltraViolet and Digital Copy will makes it possible for you to stream the movie Unsane HD UV or iTunes Code instantly to your computer and compatible Smartphones, Andriod, iphone, iPod Touch, iPad and tablets devices anytime, anywhere. You can also download a Digital UltraViolet Copy or a Digital Copy of the movie Unsane HD UV or iTunes Code to your computer and compatible devices. Academy Award-winning director Steven Soderbergh plunges audiences into the suspense and drama of a resilient woman's fight to reclaim her freedom even as she risks her own sanity. Still scarred from the trauma of being terrorized by a stalker, Sawyer Valentini (Claire Foy, The Crown) receives treatments at the Highland Creek Behavioral Center. However, shortly after she unwittingly commits herself to the mental institution and is unable to leave, she catches sight of a facility staffer who, she is convinced, is actually her stalker. But is he real or a product of her delusion?